Well then, Munster are the first team through the the semi-finals. Next up is Saracens v Glasgow Warriors in their quarter-final, kick off is 15:15. The winner, of course, will play Munster in the last four. You can follow the match and listen to live commentary here. Edinburgh head coach Richard Cockerill has been speaking to BBC Scotland. Naturally, he's hurting. "It was a good game of rugby, and it was going to come down to fine margins. We're depserately disappointed but very proud of the performance," he said. "It's something we've got to build on. It's not alright to lose, I want to win, but I don't think that team could have given any more today. "We probably played more rugby than them. We had opportunities in the first half to take points, our kickers weren't comfortable so we went to the corner. I'm pretty cheesed off. Plucky losers is not really my thing." Quote Message: You’ve got to take lessons from every game and you take more from games you lose than games you win. It will be interesting to see how long Edinburgh take to get over this. It’s about how they bounce back. I don’t know how they’ll be feeling but I think it’s the manner in which they've lost which they will have to take lessons from. I don’t think they’ll implode, I don’t think Richard Cockerill will let let them. You’ve got to take lessons from every game and you take more from games you lose than games you win. It will be interesting to see how long Edinburgh take to get over this. It’s about how they bounce back. I don’t know how they’ll be feeling but I think it’s the manner in which they've lost which they will have to take lessons from. I don’t think they’ll implode, I don’t think Richard Cockerill will let let them. For some context, Edinburgh had 61% of possession this afternoon, and 64% of territory. They made 419 metres, to Munster's 217 and carried ball 187 times to Munster's 106. By any measure, that's dominance. Ultimately though, what matters is the scoreboard. Quote Message: Munster's defence was fantastic. First half they were under the cosh but they only conceded 10 points. Edinburgh didn’t convert the possession they had. That's down to a lack of having a go. They should have put a little more width in it in the first half. Did the best team win? I don’t think they did but the team that defended best did. Munster's defence was fantastic. First half they were under the cosh but they only conceded 10 points. Edinburgh didn’t convert the possession they had. That's down to a lack of having a go. They should have put a little more width in it in the first half. Did the best team win? I don’t think they did but the team that defended best did. Quote Message: An extra-ordinary breathless end to the game. Munster's defence won the day. Edinburgh threw everything at them. They’ll be sick - almost like the Six Nations when they were suckered by Keith Earls. Munster know how to close out games. An extra-ordinary breathless end to the game. Munster's defence won the day. Edinburgh threw everything at them. They’ll be sick - almost like the Six Nations when they were suckered by Keith Earls. Munster know how to close out games. 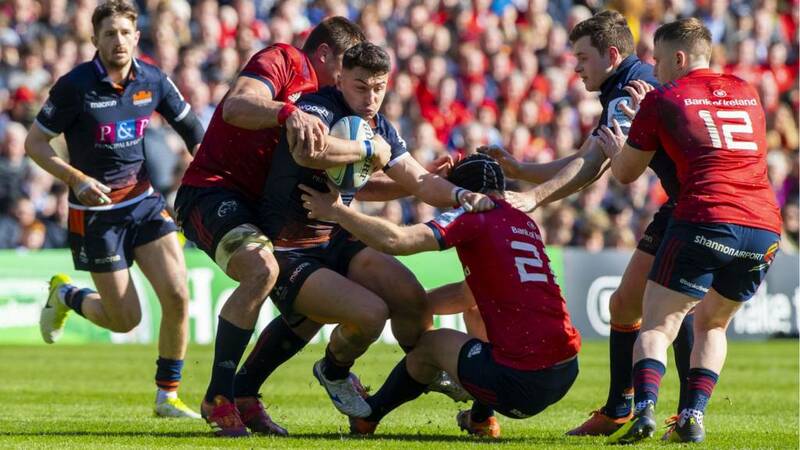 Quote Message: In the last minutes Edinburgh looked like they were going to get behind them but there was always a Munster man. It’s a brutal environment. If you don’t take your chances it comes back to haunt you. In the last minutes Edinburgh looked like they were going to get behind them but there was always a Munster man. It’s a brutal environment. If you don’t take your chances it comes back to haunt you. Munster back-row and captain Peter O'Mahony has been named man of the match, and he's been speaking to BT Sport. "Very proud. It took every bit of us, it's a quality Edinburgh side. They can probably count themselves unlucky, they played a lot of the rugby. "We defended well. Small margins, small moments decided the game. We're very happy to come away with the win." Well, that wasn't one for the purists but the players left nothing out there. Edinburgh had most of the territory, but could only manage one score in the first half through Chris Dean. Munster were utterly brilliant in defence and showed how streetwise they are with some big turnovers at crucial times. They also produced the one moment of class in Kieth Earls' second try, which ultimately won them the game. Not a vintage performance from them, but they march on to a third straight Champions Cup semi-final. Winners. Knock. On. We're done. Brutal defence from Munster there, a monumental effort. Edinburgh are trying, and failing, to find a gap in the red wall. They're back inside their own half. Incredible defence from Munster. Edinburgh look out of ideas. Edinburgh are just outside the 22. Damien Hoyland steps inside and is brought down. Munster are forcing them backwards now though. Can they produce something from nothing? Edinburgh are coming from their own half. Nice hands out left and Darcy Graham gets a half break but there's still a long way to go to the try-line. Quote Message: Munster have defended well, they've been dogged and showed the one bit of class for Earls' second try. Munster have defended well, they've been dogged and showed the one bit of class for Earls' second try. Expertly done by Munster. Peter O'Mahony gets a hand to Ross Ford's throw, Edinburgh get the ball back but it's then knocked forward. O'Mahony wreaking his usual havoc. Outstanding. Quote Message: It's going to take a bit of magic to win this game. Munster have the bit between their teeth. It's going to take a bit of magic to win this game. Munster have the bit between their teeth. Pierre Schoeman's offload is knocked into touch on halfway by Keith Earls. Edinburgh will have the line-out. A big, big play is needed here. Turnover! The ball is stripped and cleared. Edinburgh find themselves just outside their own 22.